Alaska is the only state of the United States that is situated in the North Polar Region. Located in the extreme northwest of North America, Alaska occupies the continent's largest peninsula and is subcontinental in size. As befits its vast extent, Alaska is a land of great diversity, with climate zones ranging from tundra to temperate rainforest. About one-third of the landmass is situated within the Arctic Circle. Alaska's area is 1,530,700 sq km (591,004 sq mi), or about 16% of the United States' total land area, and the state has 10,686 km (6640 mi) of coastline. The maximum N-S distance is 2285 km (1420 mi) and that for E-W is 3639 km (2261 mi). Alaska's only land borders are with British Columbia and the Yukon Territory in Canada; the state is separated from the 48 conterminous United States by Canadian territory. 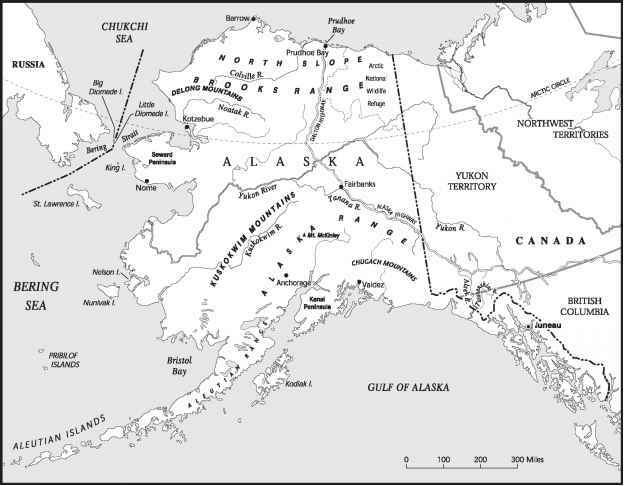 Alaska's coast is bounded by the Arctic Ocean, Bering Strait, Bering Sea, Pacific Ocean, and Gulf of Alaska as well as smaller bodies such as Bristol Bay, Cook Inlet, Norton Sound, and Kotzebue Sound. Much of the state is mountainous, and major mountain ranges include the Alaska Range, Brooks Range, St Elias Mountains, Boundary Range, Wrangell Mountains, and Chugach Mountains. The highest peak, Denali (Mt McKinley) (6194 m/20,320 ft), is located in the Alaska Range near the center of the state and is the highest point in North America. Alaska contains the 11 highest peaks in the United States. Alaska's islands and island groups include the Alexander Archipelago, with over 1000 islands in the southeast of the state; Kodiak Island; the Aleutian chain, which spans 1100 mi and consists of 14 large islands (of which Unimak, Unalaska, and Umnak are the largest) and numerous smaller islands and islets as well as active volcanoes; and the Bering Sea islands including St Lawrence, St Matthew, Nunivak, the Pribilofs, and Little Diomede Island. Alaska's major rivers include the Yukon, Kuskowim, Porcupine, Tanana, Koyukuk, Copper, Colville, Susitna, and Matanuska. Alaska is subject to large earthquakes, the largest of which took place in 1964, destroying parts of the city of Anchorage and other towns and measuring 8.4 on the Richter scale. Alaska contains abundant natural resources, the presence of which has prompted much recent settlement and exploitation. Important fish resources include salmon, cod, pollock, herring, halibut, and crab. Forest resources are also important and are concentrated in the southeast part of the state. Agricultural resources and agricultural potential are more limited, but some cooler growing vegetables as well as dairy cattle are produced in some areas, especially those adjacent to the larger cities of Anchorage and Fairbanks. Alaska has a wide variety of mineral resources, including zinc, lead, silver, gold, copper, molybdenum, and coal, as well as sand and gravel. Petroleum resources, including oil and natural gas, are especially significant. Alaska is the nation's largest oil producer, primarily from oilfields around Prudhoe Bay on the North Slope. Hydropower potential is enormous but is largely untapped at present. Most power generation in the state is from the burning of diesel and coal to generate electric power. Main cities, rivers, mountains ranges, and islands in Alaska.